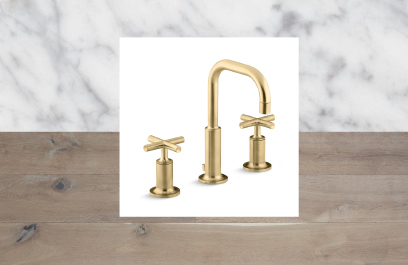 MIXED METALS – Gold tones have made a comeback the last few years and we see this continuing to trend through 2017. 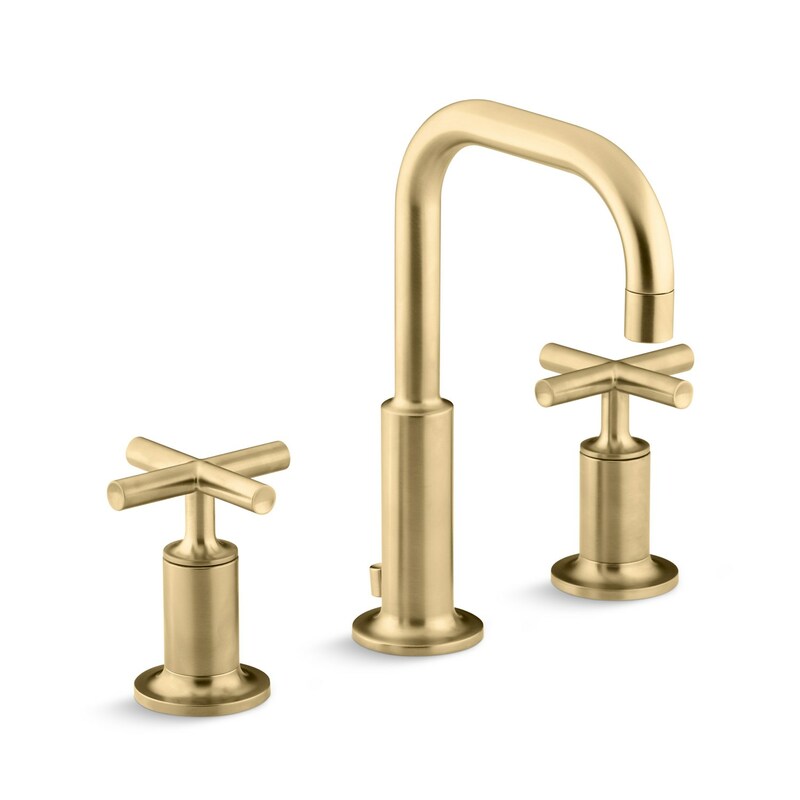 Our favorite is a brushed matte gold finish! There is something warm and understated about it. It is a more transitional look that has the ability to complement multiple styles and looks amazing against almost any color. GREEN – The 2017 Pantone Color of the Year “Greenery” is popping up in home décor and accents. This refreshing and revitalized tone adds the perfect pop of color and touch of nature to any space. From throw pillows to greens, and other small accents, this color is sure to make a statement! MARBLE – One of mother nature’s best creations! 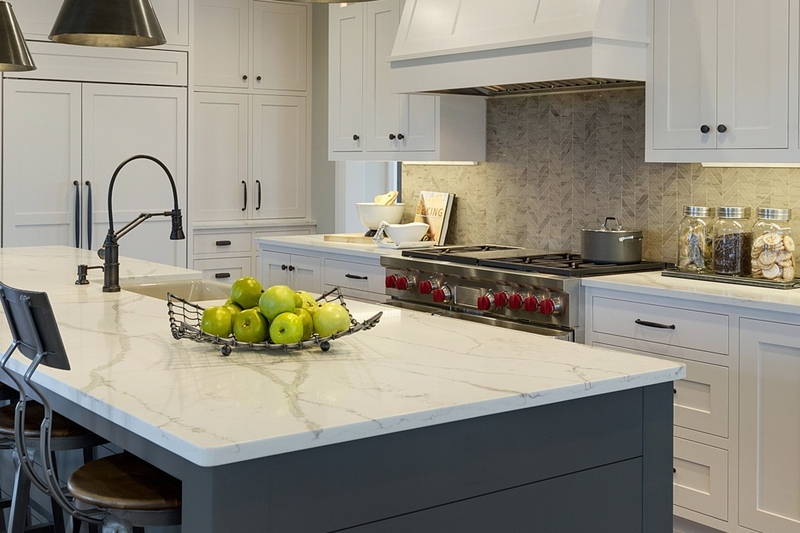 Quartz surface manufacturers know how important it is to achieve the look of marble or natural stone without the added maintenance, and they finally have the technology to do it! 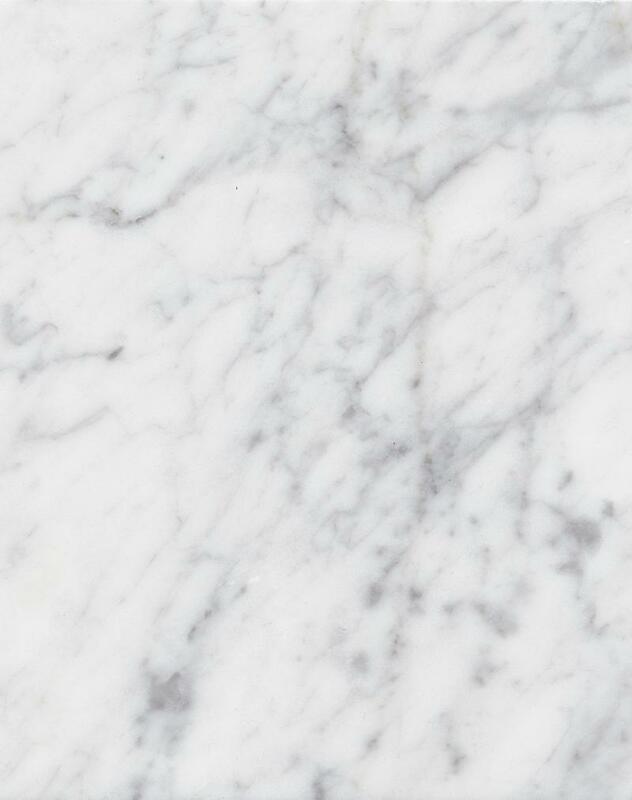 Naturally beautiful; marble is timeless, sophisticated and always trendy. TEXTURES – Fabrics are a great way to add visual stimulation to your home with texture and pattern. The textures from fabrics are making their way to the tile & hard surfaces industry. You can use three-dimensional tile depths to create intricate 3D patterns in shapes such as hexagons and ovals or penny rounds. Ribbed surfaces can also be used to resemble corduroy or metallic fabrics. NATURAL WOOD TONES – Natural woods have always been in style and always will be. We are seeing a move toward lighter natural looking wood from floor to ceiling. Homeowners are moving away from a high-sheen floor and embracing raw, wire brushed and hand scraped textures. Not only is lighter flooring easier to keep clean, it makes your space look bigger, brighter and more open! While white kitchens will never go out of style, we are also seeing a move toward warmer materials and a less utilitarian or expected approach. SPLURGING ON SECONDARY SPACES – Kitchens and bathrooms are a primary focal point when building a new home. 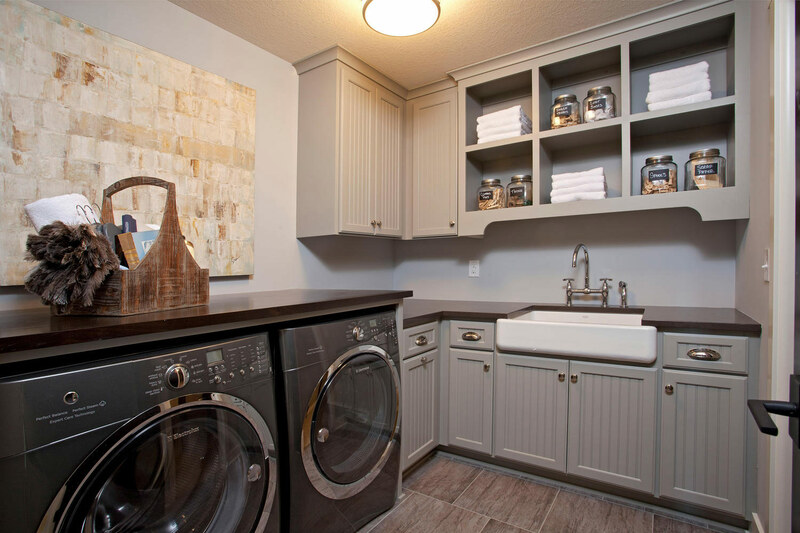 We are finding that homeowners want their laundry rooms, bedrooms, rec rooms, and other secondary spaces to look equally as great! Utilizing smarter storage, better functionality, natural light, and attention to detail makes each space more unique! SMART FEATURES – In the world of Siri and Alexa, smart features in a home have become a must. People want to have a smart home that they can operate remotely from their cell phones or speak commands to without having to lift a finger. There are endless amounts of smart features available to incorporate into your home. Talk to a low voltage specialist to find out what best suits your lifestyle and needs! These are just a few trends that our designer sees becoming more popular in 2017. Do you have other trends you are looking forward to seeing this year? Let us know! 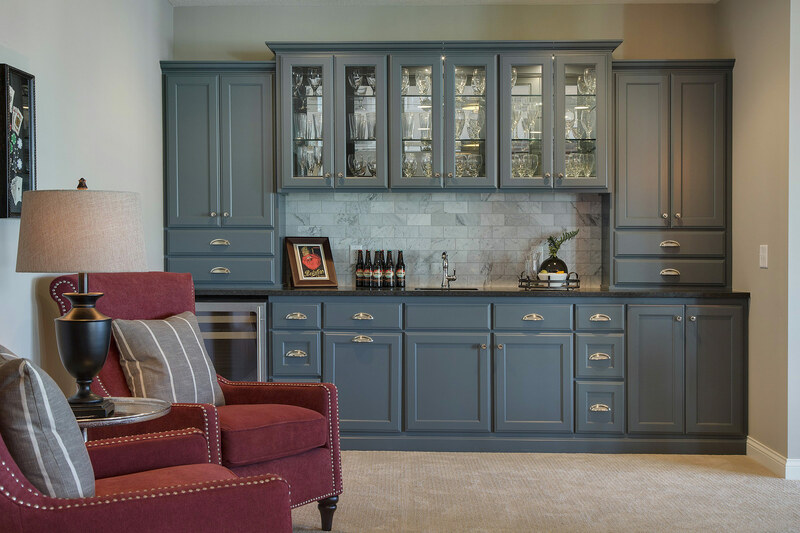 To see previous years trends, check out our 2016 and 2015 Design Trends blogs. For more questions on our custom home builder process, contact us at info@homesbytradition.com. I like that you mentioned the new smart features being integrated into newly built homes. One really neat technology I’ve heard of is windows that can dim themselves. I’d love to have a home with windows like that or lights that can be scheduled to be turned on and off using my smartphone. Nice post! Thanks for sharing new designing trends for new custom home decor. I can easily see most of these trends continuing into 2018!